I hope you have a few minutes! Here’s the story of my Major Nichols bike (MN6673). The year was probably somewhere in the mid 60’s and at the time I was riding a second-hand Planet Pintail to work in the centre of Birmingham. Being a bit naive at the time, I used to leave it unlocked at the back of the premises while I went inside to work. Needless to say it wasn’t long before it got stolen! I was absolutely gutted and quickly learned a lesson: never leave your bike unattended or unlocked! 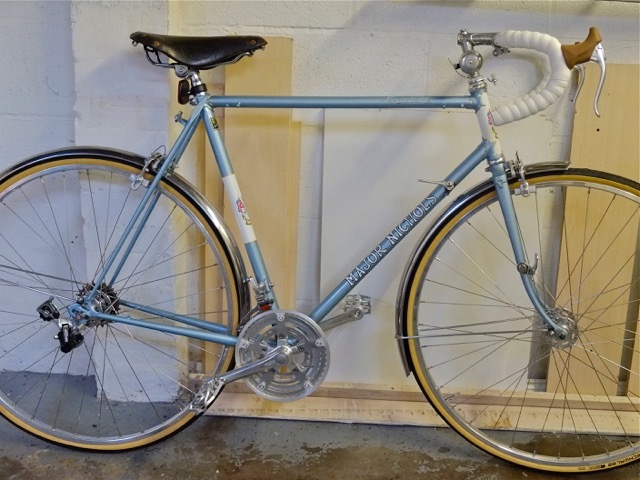 I decided that this time I would invest in a new bike, and a friend told me about this chap called Major Nichols who would make a frame to your own specifications. I liked the idea so sent Major Nichols a letter containing my very detailed specifications from measurements, angles, kind of curve on the forks, and colour etc. When my dad went to pick it up for me, Major told him that he had never come across anyone who gave such detailed specs without even visiting the shop! It was to be some years before I actually met the man. Major only supplied the frame. I set about purchasing all the necessary parts until one sunny day I took it all out into the back garden and pieced it all together. It was truly a sight to behold with its twin gold bottles on the handlebars and everything so shiny. I rode the bike daily everywhere for many years until eventually it began looking a bit worse for wear and in need of a loving restoration. By now we were living in Telford and the year was somewhere around the late 1990’s. The bike was still rideable but only occasionally saw the road. However, I had fond memories of its former glory and a thought began to develop in my mind. As I had access to a Birmingham Business Telephone Directory, I took a look to see if Major was still in business. He was! Or at least someone by the same name was. I thought that it may have been his son, believing that Major himself must have passed on by now. 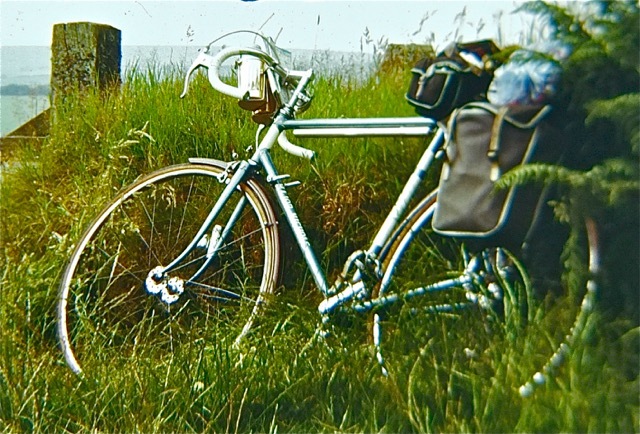 I phoned the shop and to my amazement found myself talking to the man himself who assured me that he was very much alive, although in his eighties and would be only too pleased to renovate my bike so long as I understood that it would not be quick! I took my frame along to his shop which by now was in Smethwick and met the chap for the very first time. I must say he lived up to everything I had heard, and more! I liked him, and he must have taken a liking to me because from what I have gathered he would have soon sent me packing if he didn’t! Some time went by. In fact about 18 months went by. Still no bike. Eventually I realised that if I was ever to get it back I would have to be pretty quick, so I arranged to pay him for what he had done and told him that I would do the rest myself. 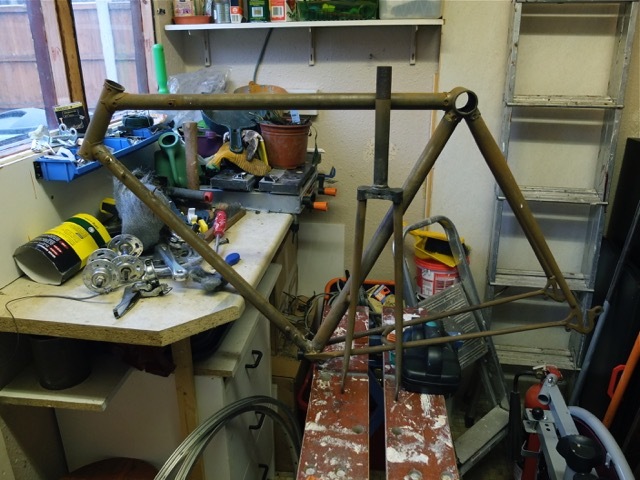 Major, for reasons best known to himself, had sand blasted the frame down to bare metal and then set about ‘repairing’ parts that I didn’t think needed repairing. 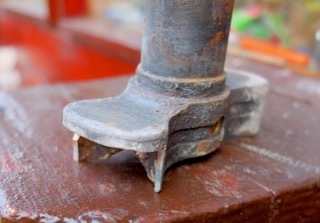 Parts like the wrapover and the fork head. Also, for some reason he removed the rear brake hanger but never got around to replacing it. However, Major sold me some spare parts at silly prices, like alloy wheels and large-flange hubs, a chain set and chain, gears and even (believe it or not) a set of his precious transfers! 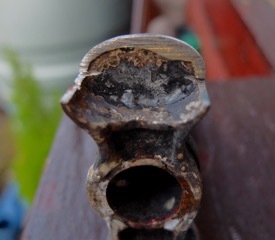 So to summarise: I took Major a rideable bike and came back home with a rusty set of bits and pieces. Major Nichols built the bike, and Major Nichols ruined it! Shortly afterwards I read that there had been a break in at the shop and Major had ended up in hospital. He died shortly after. The end of an era. However, I had my bike, even though in pieces and looking very brown, and that’s how things stayed until the spring of 2013 when my son, tired of hearing tales of my precious but now ruined bike, decided to spur me on to great things. He showed me some websites of bicycle companies who specialised in spare parts, many original, and urged me to set about it! I found a local frame builder (So there are some left!) 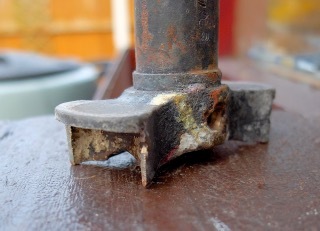 who was willing to undertake some repairs. 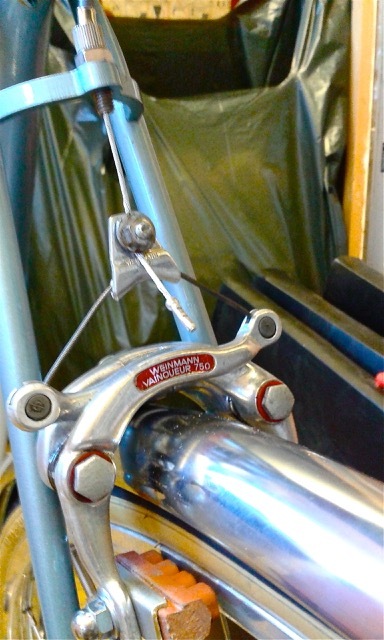 I was told that a new front fork head would be needed but as an identical flat-top one proved impossible to obtain they carefully cut the patterned parts off the hand-cut one of Major Nichols and inserted them into a new, but sloping, head. I wasn’t too keen on the sloping shoulders but at least the shaped points were original and it was a nice clean job. They also fitted a new rear brake hanger and a welded bracket for the front changer as I always disliked the way the detachable bracket scratched the paintwork. 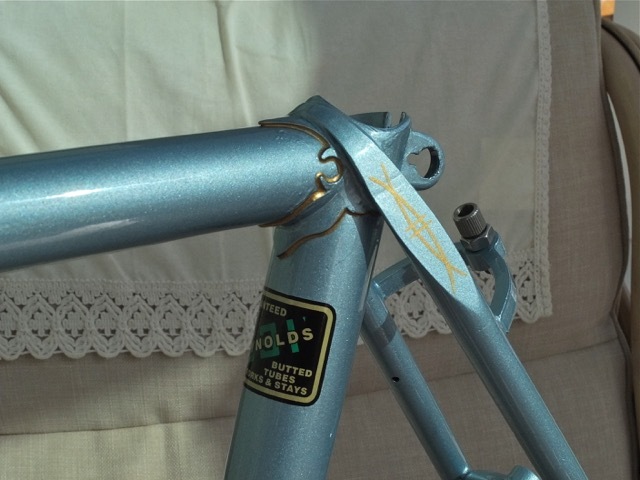 The frame was sprayed by Bob Jackson to the identical colour of the original, though with a simpler white panel on the seat tube and gold lines around the lugs that, to my mind, were not quite up to the standard of the original ones by Major Nichols. However, it looked very good and over the next few months I set about purchasing and fitting all the bits and pieces until I have the bike you now see. The gears are Shimano rather than Campagnolo but at least they came from Major Nichols who sold them to me when I bought my frame back. 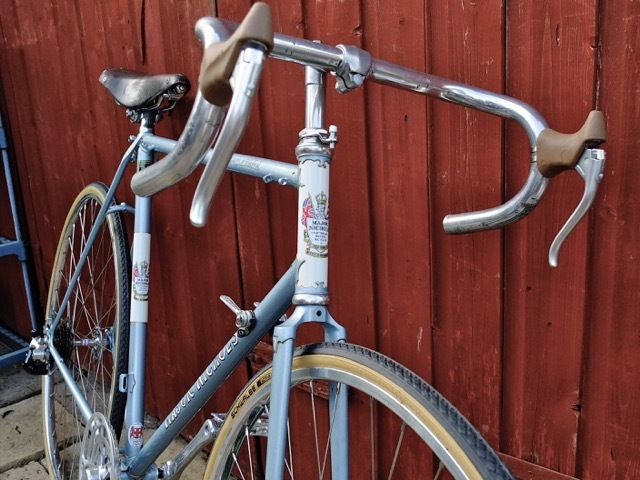 The gear levers are original Campags, and the brakes original Weinmann but with new generic levers. 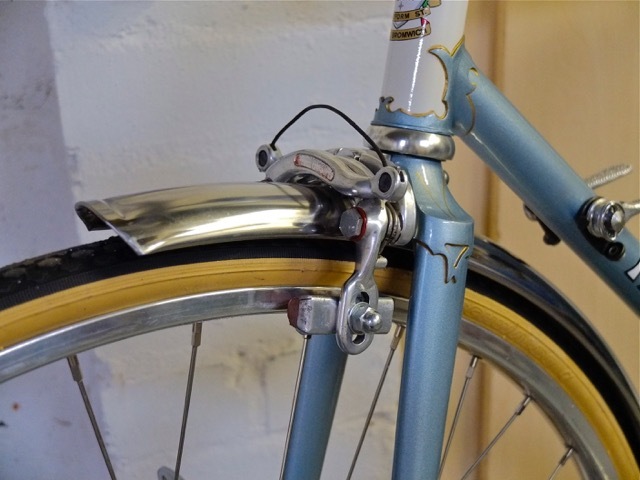 Saddle, still the original Brooks B17, nourished with leather treatment and buffed to a nice shine. 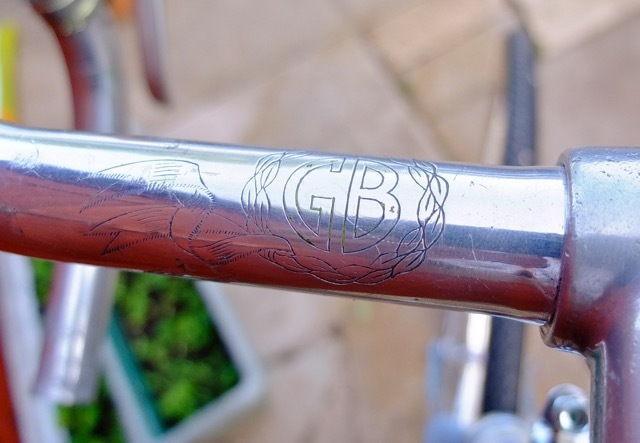 Handlebars and stem GB with an amazing pattern engraved onto the bars. I found it very difficult to get parts that fit because everything is now metric. So the inner tubes, although supposed to be OK for 27 x 1 1/4” were actually slightly too big so they crumpled up inside the tyre, and although it was possible to purchase a new lamp bracket for the front fork it was impossible to get a light to fit it as no one makes them anymore! Even the domed nuts with attached washers for the front wheels proved impossible to find. I had to make do with ordinary nuts in a plain finish. Anyway, it is all done now and I must say that I enjoyed putting it together every bit as much as the first time. There’s only one trouble: it looks so good, and I’m so scared of getting it pinched that I’m frightened to ride it anywhere! There’s also the small matter of me being a bit older now than when I first bought it. However, it hangs from my garage roof (securely locked up) and in the summer I’ll take it out for a local spin, just to bring back memories and keep the bike (and me) in running order. Great story Colin, would love to see “The Major” sometime. Looks a beauty! A ‘Major’ revelation! I didn’t know you were THAT much into bikes. Lovely machine.